Hotel Television Systems - What Are Your Choices? Hotel Television Systems – What Are Your Choices? Choosing Hotel Television Systems used to be simple. Today when you start talking about high definition TV for Hotels, the DRM encryption required by the programming suppliers, and the wiring prerequisites for each television system type, your options can be daunting to wade through. Cutting through all the terms and system types is only the first step for the hotel owner or general manager. There are many different types of high definition Hotel TV Systems, DRM encryption and television sets available for your hotel or institutions. Let’s start by defining the types of systems, the DRM encryption options and hotel wiring requirements. There are 5 main types of high definition hotel television system available. We help you to learn what type of hotel TV systems are available for your property and which system is the best fit for your needs. 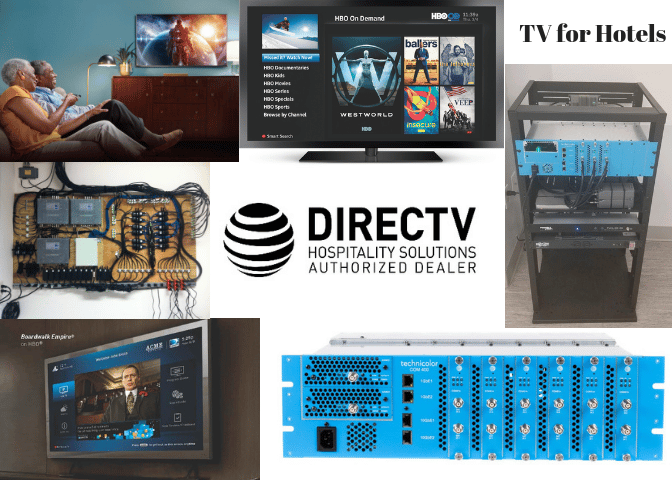 COM3000 HD/4K Headend TV System – The New DIRECTV COM3000 Headend by Technicolor is the latest in a line of revolutionary headend television systems from DIRECTV. It is the smallest and most powerful headend TV system available for hotels, RV parks and campgrounds, assisted living facilities, senior living facilities, healthcare, college and corporate campuses, institutions, bars, restaurants, and other commercial applications. The COM2000 is an upgrade to the COM1000 that has become the industry standard since its release in 2009. This plug and play system makes revolutionary leaps in reducing the required space (3U) and energy consumption (225w) for a hotel headend system. The COM2000 can be used with any of the current DRM encryption systems. A groundbreaking system that provides hotel guests with the same TV experience they get at home with full channel availability and a Co-Branded welcome screen system that includes local information insertion and checkout folio. This is he most common type of hotel TV system in the US with over 20,000 installations according to the SBCA. An L-Band Hotel TV distribution system is a television system for multi-client properties where the programming from satellite antennas is distributed via coaxial cable to the room where a receiver placed at each television is used to make the channel selection and provide DRM encryption. Using IPTV based hotel television system the TV programming is distributed from your television headend to your guest rooms via your hotel’s Local Area (data) Network or LAN via CAT 5/6 cable. Programming providers like Disney, HBO, ESPN and others now require that hotels provide an encryption system or DRM to protect the high definition, digital TV signal broadcast to the in-room TV from piracy. There are 3 main providers of DRM systems. There are several things you need to know in terms of the wiring for your Hotel TV System. The type and configuration of your hotel tv system wiring will determine what television system type you can take advantage of and the type of HDTV you should purchase. Before HDTV, picking a TV meant which brand were you going to buy. Today, in addition to brand, you have many choices to make when it comes to your Hotel TV. Some of your choices in Hotel TV types will be determined by the section on hotel television system wiring. After determining the type of system, encryption and TV is best for you, you still need to choose a supplier of the actual television programming. The 1st choice you have to make here is what definition you would like. If you have purchased 1080P enabled televisions, you will want 1080p or Blu-Ray quality programming. Once you decide on the quality of signal you want you will have narrowed your choices for programming. HD programming from Cable and OTA is only available in 720P, a lower level of quality. Satellite programming is available in 1080P, with DIRECTV delivering more channels in HD and all its HD programming in 1080P. We help you to find the programming package that best fits the desires of your guests and your budget. It’s All About Satellites is here to help you fight through the clutter and understand the best hotel tv system for your hotel. We specialize in HD Television Systems for Hotels, Motels, Casinos and Assisted Living / Senior Care Centers and make choosing your next Hotel TV system as painless as possible.